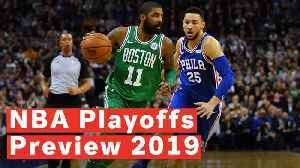 RESENDING WITH UDPATED SCRIPT SHOWS: CHARLOTTE, NORTH CAROLINA, UNITED STATES (FEBRUARY 17, 2019) (NBA ENTERTAINMENT - ACCESS ALL) 1. INTERIOR SPECTRUM CENTER - NBA ALL-STAR GAME MVP KEVIN DURANT WALKING INTO POST GAME NEWS CONFERENCE 2. 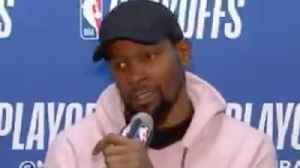 (SOUNDBITE)(English) KEVIN DURANT SAYING: "It's all sweet to me I mean, it's hard to rank, everything's special but it's cool to be out there with some of the best players to ever play the game and to win MVP in front of my family and friends is pretty sweet so, I'll just try to keep racking them up I guess." 3. TEAM CAPTAIN LEBRON JAMES AT POST GAME NEWS CONFERENCE 4. 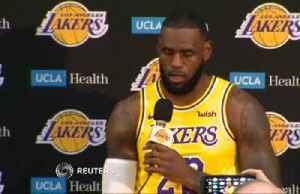 (SOUNDBITE)(English) LEBRON JAMES SAYING: "I feel great, sorry to cut you off Joe, I feel great, looking forward to the second half of the season and looking forward to see what we (Los Angeles Lakers) can do to get back in this playoff race, that's my only mindset, you know that's the only thing that's gonna have my mental space for this next two months, you know pretty much, how I can get this team playing the type of level basketball we were playing before my injury." 5. TEAM CAPTAIN GIANNIS ANTETOKUONMPO AT POST GAME NEWS CONFERENCE 6. (SOUNDBITE)(English) GIANNIS ANTETOKUONMPO SAYING: "Honestly I didn't even know that there had never been an international player to win (All-Star) MVP. You know I was just trying to play hard, have fun, you know previously, my first and second all-star I think I was kind of nervous, this one I was little bit more relaxed, you know I had my name on the MVP until the third quarter, they got hot and took it away from me but at the end of the day I had fun, my family had fun, and it's just a great experience." 7. 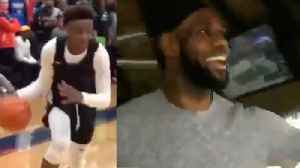 (SOUNDBITE)(English) LEBRON JAMES SAYING: "You put me on the floor I love to compete, I'm a competitor no matter what it is, you know I was competing to see if I could get to this table first, did anyone come in before me? (PERSON OFF-CAMERA ANSWERING "NO") See what I'm talking about, see you all the second half of the season." 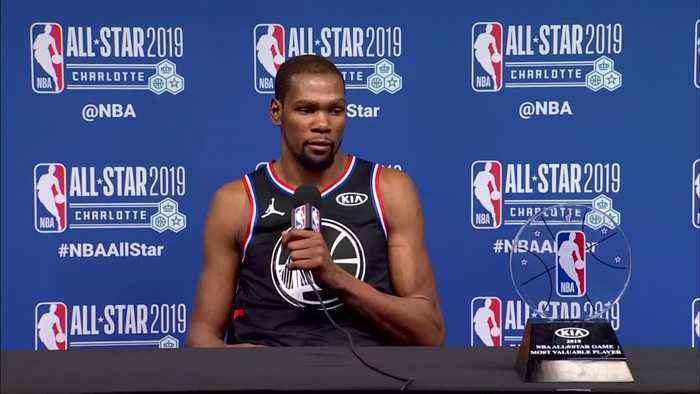 STORY: Kevin Durant scored 31 points and won MVP honors after outdueling Giannis Antetokounmpo to lift Team LeBron to a 178-164 win Sunday (February 17) night in the 2019 NBA All-Star Game. 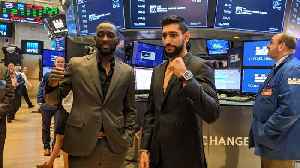 In the "First in Flight" city, players showed up Sunday ready to launch. Team LeBron attempted 90 3-pointers (hitting 35), and the teams combined for 168 tries from deep. Durant helped put the game away for Team LeBron with a 3-pointer with two minutes left for a 171-160 lead. Kyrie Irving made a leaning floater and Durant hit 15-footer from the wing to seal it. Just before Durant's closing stretch, James shook off 76ers forward Joel Embiid for a corner 3, and on the next trip, pounded home a one-handed slam on a lob from Irving that extended Team LeBron's lead to 168-158. 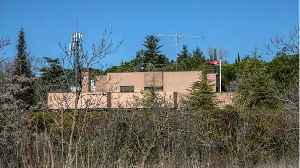 Trading long-distance daggers and mixing the occasional lob off the glass, Durant connected on a pair of 3-pointers from the right side to give Team LeBron on 161-153 lead at the five-minute mark in the fourth as shots started to fall short and handles were less certain. Curry brought the Spectrum Center to its feet at the final buzzer, catching the ball off a hard bounce from himself and throwing in a reverse jam. He did the same with a four-point play early in the fourth -- knocking down a 3 from the right wing as Warriors teammate Klay Thompson of Team LeBron pushed him to the floor -- and DeAngelo Russell added a 3 of his own, staking Team Giannis to a 148-145 lead with 8:35 left in the game. 76ers guard Ben Simmons gave Team LeBron the lead 132-131 with 36 seconds left in the quarter, closing what had been a 95-82 deficit at halftime. Team Giannis led by 20 in the third. Damian Lillard's 25-footers on consecutive possessions pulled Team LeBron even at 127-all, but Russell Westbrook put Bradley Beal on skates two straight trips for easy layups at the rim. Thompson drained a 3 from the corner in front of the Team Giannis bench to trim what was a 20-point lead in the third to five, 120-115, and Beal followed with a 3-pointer of his own off a turnover to cut the advantage to 120-118. Played above the rim in spurts, the game threatened to become a full-fledged 3-Point Contest. The first half consisted of 81 3-point attempts -- 29 successful -- between the teams. Team Giannis led 95-82 at halftime. Antetokounmpo led all scorers with 20 in the first half, en route to a game-high 38. He was on a dunk-a-minute pace to start the game. In the opening seven minutes, he had 16 points to fuel Team Giannis to a 36-22 edge, while assisting on 3-pointers by Bucks teammate Khris Middleton on three consecutive possessions. Curry, the de facto player host because of his local roots, got on the board with 5:32 left in the first half and was 2 of 7 at halftime. Honorary All-Stars Dirk Nowitzki and Dwyane Wade checked into the game with 58 seconds left in the first quarter. Nowitzki splashed a 3-pointer from the right wing on his first offensive possession, and drained another from the left wing on the subsequent possession, giving Team Giannis a 53-37 advantage entering the second quarter. He added a third at the 9-minute mark in the second quarter and scored nine points on 3-of-3 shooting in 3:58 in the opening half. Kevin Durant got a little cocky for Thursday nights game against the Los Angeles Clippers and it proved to work but don't let this distract you from the fact that the Warriors blew a 31 point lead in..
As the candidates get lined up for the new vacant head coaching job with the lakers some of the top hopefuls are advised to not take the job by nearly everyone in the league.But sources have also..
Like father, like son, Bronny Jr. comes thru CLUTCH for his AAU team, and pops is beyond proud of his son. I got the game winning bucket for you, and this thing looks very familiar. 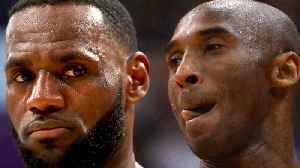 Is Lebron james the new Kobe bryant? Well if you are a laker fan I think that's what you were hoping for since Kobe won 5 championships for the franchise. But after the Lakers missed the playoffs yet..
For the first time in 14 seasons, the NBA Playoffs will not feature LeBron James. Will the Golden State Warriors win their 3rd straight title, or will a new contender emerge? 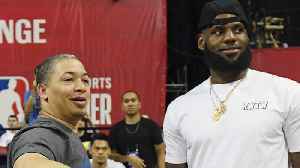 Los Angeles Lakers superstar LeBron James failed to make the playoffs for the first time in 13 seasons, forcing the NBA to look elsewhere for superstars to draw ratings and to compete with the two-time.. 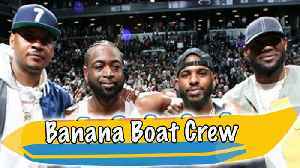 The whole banana boat crew came out Wednesday night for NBA baller Dwyane Wade's last and final dance. 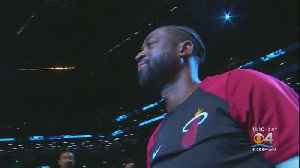 the 37 year old 13 time all star played his final NBA game Wednesday night and the story couldn't..
Dwyane Wade wrapped up his NBA career Wednesday night in Brooklyn, recording a triple-double in front of friends like LeBron James, Carmelo Anthony and Chris Paul.